The question, of course, is whether or not the t is silent. I checked eight online dictionaries. Three of them gave only one pronunciation — the silent t version, (aw-fin). 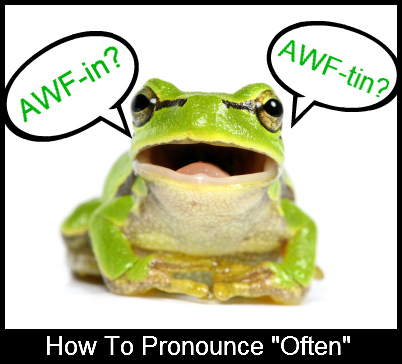 The other three listed the silent-t version first and the “spelling version” (awf-tin) as a secondary, or alternative pronunciation. That’s about what I expected. Some outspoken experts on such matters insist that pronouncing the t is either pretentious or ignorant. This includes the controversial titan of usage, H.W. Fowler, and, more recently, Charles Harrington Elster. Most grammarians and dictionaries these days, while preferring the silent-t, are willing to accept the hard-t version. Pronunciation guides since the 18th century insist that the t is silent, but as literacy became more widespread, people more commonly assumed the correct pronunciation conformed to the spelling. Today, folks pronounce it both ways, usually without giving it much thought. Check Out WriteAtHome’s Great Online Writing Classes for Teens! Sticklers point to similar words like soften, fasten, listen, moisten, hasten and christen — where the t is silent — as analogous. But that, of course, assumes that English pronunciations conform to predictable patterns, which is clearly not the case. This much is true: no one insists on an enunciated t. The argument is between those insisting on a strictly silent t and those who accept either pronunciation. Personally, I take the latter position, but if you want to avoid bugging those poor souls who fret about such matters, leave out the t.
People often leave comments below. Please leave yours!